Sarson Ka Saag aka spicy mustard greens is a winter staple in Northern India. It’s usually served with makki roti (a flatbread made with maize flour), a dollop of butter and makes a nutritious meal! If there’s one thing that I really like about Indian cooking, it’s how much we cook using seasonal ingredients. I think that is so important! One should always cook and eat seasonal because the taste of these ingredients when they are in season is so much better than when they are not season. Like the sweet berries, they taste amazing in summers but not much during winters. Isn’t it? 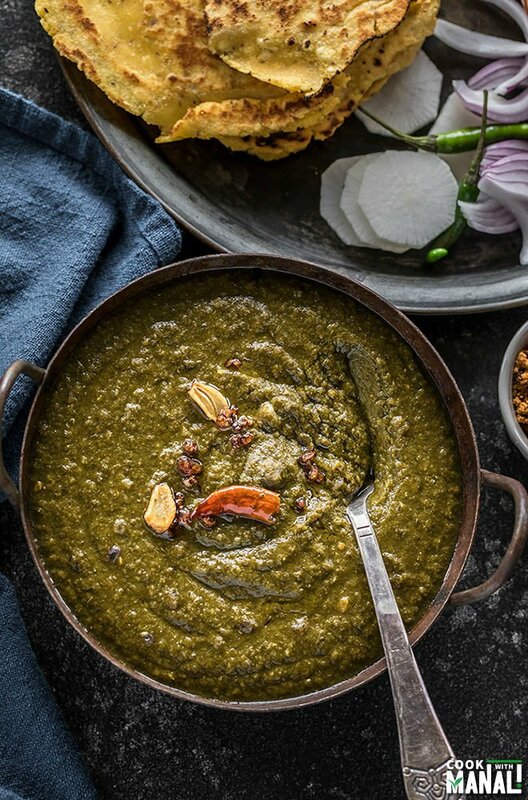 In India, during winters there are a lot of seasonal dishes like gajar halwa, methi paratha, peanut chikki and this Sarson ka Saag! This time of the year, the market is full of leafy greens like spinach, sarson (mustard greens), bathua (chenopodium), methi (fenugeek) etc. Since these leafy greens are in abundance, there are used in number of recipes and one of my absolute favorites is Punjabi Saron ka Saag! As soon as December would arrive, I would be after my mom to make sarson ka saag and makki is roti. The hot saag and rotis topped with dollop of butter and served with jaggery on the side used to be such a special meal. Saron ka saag is a winter delicacy made in North India with fresh mustard greens and other green leafy vegetables. Sarson = mustard greens, so it’s the key component of this saag. Saag = creamed spiced greens. 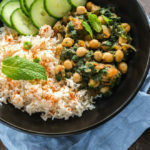 Since mustard greens are slightly bitter on their own, this saag is usually cooked with other greens to balance the bitterness. Greens like spinach, bathua, methi etc. are commonly used. I usually use 2:1 ratio of mustard greens to other greens. So for this recipe I used 500 grams greens, out of which it was 250 grams mustard greens and the remaining 250 grams were a mix of all other greens (spinach, turnip and collard greens in this case). Here I do not get bathua and methi all the time, so I used a mixed bag of greens that I got from Trader Joe’s. It had spinach, turnip and collard greens along with mustard greens. It worked really well for this recipe. Of course, if you find bathua and methi, feel free to use them along with spinach. If you don’t find anything, just mustard greens and spinach would also work. Sarson ka saag is very lightly spiced, it’s the fresh flavor of the greens that shines through and that’s what make it so delicious! Making sarson ka saag is super easy, it’s only the prep work that takes time. In India, whenever we would get these leafy greens, they would be really dirty so cleaning them would take some time. Once the greens are cleaned, they are pressure cooked along with onion, tomato, garlic, ginger, green chilies and radish until really soft. Once cooked through, you puree the greens. Some people prefer really smooth saag while others like it to be little coarse. If you want it completely smooth, use a high speed blender. I used my immersion blender and it worked just fine. The pureed saag is them cooked for several minutes until it thickens. The final tadka at the end is crucial. I usually use garlic, hing, dried red chilies and onion in my tadka. You can add ingredients as per your taste. And yes, you have to use ghee for the tempering. I cannot imagine eating saag without ghee! Sarson ka saag tastes even better the next-day, at least that’s what I think! In all of north India, especially Punjab and Delhi, you would find sarson ka saag served with makki ki roti and fresh white butter. Makki ki roti is a flatbread made with maize flour, it’s little tricky to make especially if you are not mixing in any wheat flour. It’s smeared with ghee and enjoyed with the saag, it’s a classic match and in my opinion, should always be eaten together. You can of course eat saag with roti, naan or rice too. Yes, you may, just don’t do the tadka in that case. Pressure cook the saag, puree it and then let it come to room temperature. Once it has cooled down to room temperature, store in a freezer bag and freeze. When you want to eat it, thaw the saag and then do the tadka before serving the saag. 1- Wash and chop the greens and then add them to the pressure cooker. Then add the chopped onion, garlic, ginger and green chilies. 2- Add tomatoes and white radish. 3- Then add the red chili powder and salt. 4- Add 1.5 cups water and stir. 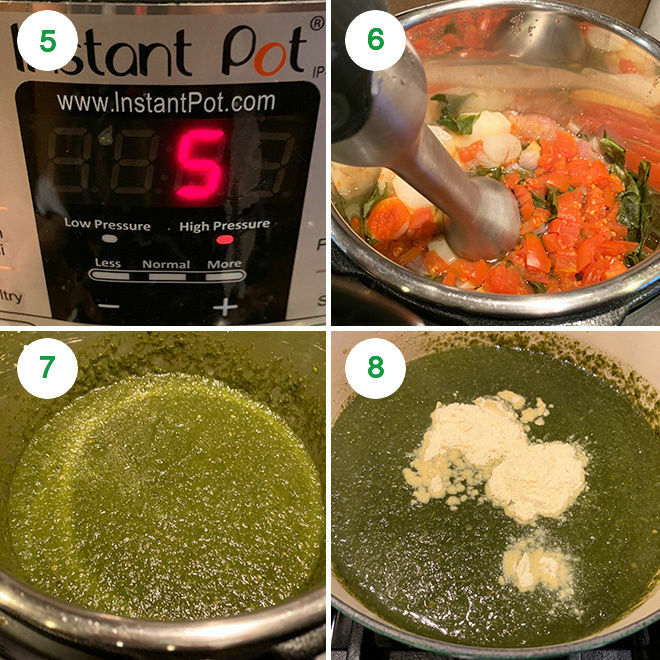 5- Pressure cook for 5-6 whistles on high heat (using a traditional stove-top pressure cooker) until everything is soft and done.If using the Instant Pot (like I did here), cook on high pressure for 5 mins and then let the pressure release naturally. Alternatively, you can also cook everything on a stove top for 20-25 minutes until soft. 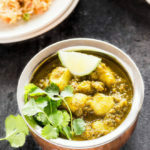 6- Open the pressure cooker/instant pot and then use an immersion blender to puree the saag. If you don’t have an immersion blender, wait for it cool down a bit and then puree using your regular blender. 7- Blend to a coarse paste. You may blend it to super fine texture using a high speed blender. I prefer it little coarse. 8- Transfer saag to another pot on stove top over medium-low heat. Add 2 tablespoons of maize flour to the saag and mix, this helps in thickening the saag. 9- Set heat to low and let the saag simmer for 20 to 25 minutes on low heat. It will thicken as it simmers. 10- For the final tadka, heat a small pan on medium heat. Once the pan is hot add ghee to it and then add hing and chopped garlic cloves. Saute for few seconds and then add the chopped onion and dried red chilies. 11- Cook until the onions and garlic turn light golden brown. Add the coriander powder and garam masala and mix. 12- Transfer the tadka/tempering to the saag and mix. 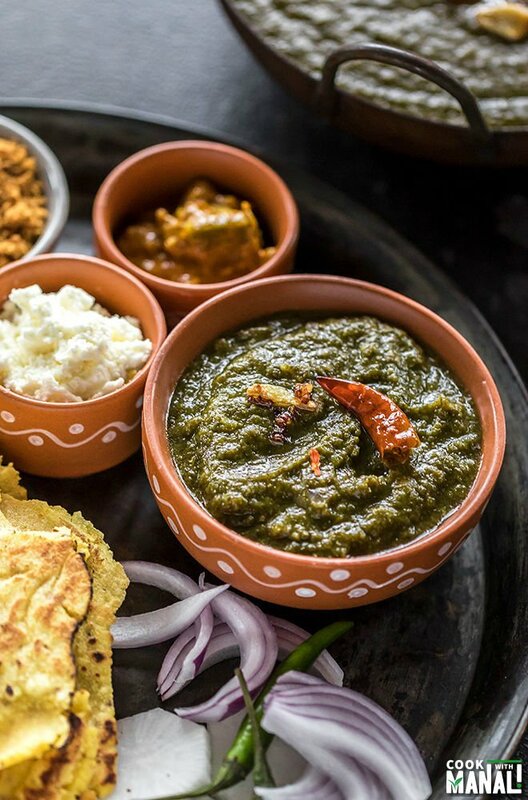 Serve sarson ka saag with makki roti, sliced onion, jaggery and white butter! YUM! 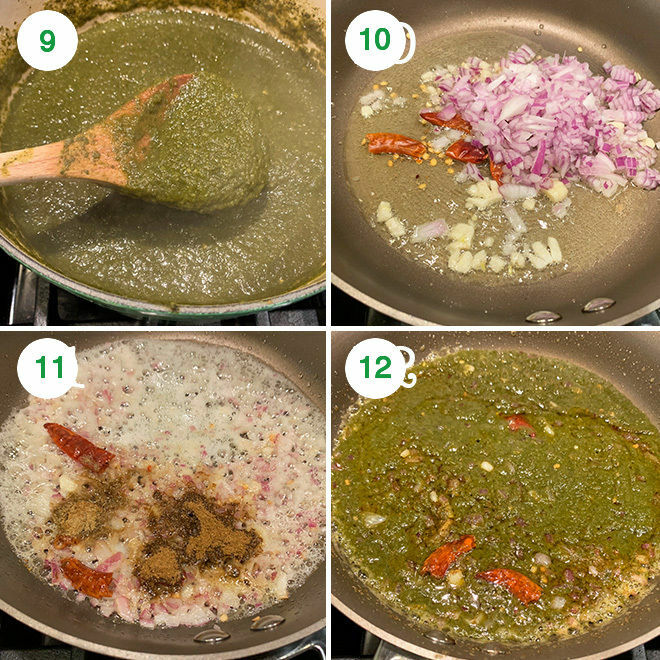 If you’ve tried this Sarson ka Saag Recipe then don’t forget to rate the recipe! You can also follow me on Facebook, Instagram to see what’s latest in my kitchen! 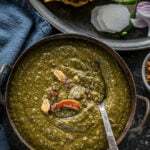 Sarson ka Saag is a winter staple in Northern India. 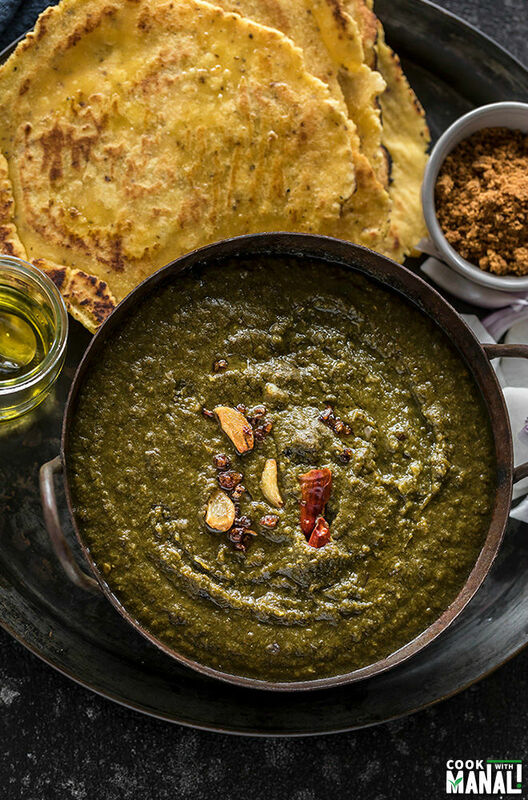 Spiced greens are pureed and then served with makki roti (flatbread made with maize flour) and dollop of butter. It makes a wonderful vegetarian nutritious meal! 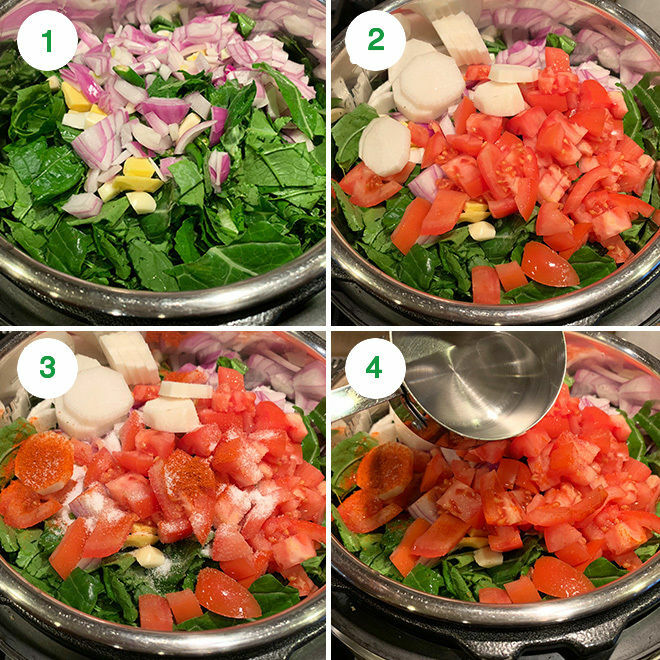 Wash and chop the greens and then add them to the pressure cooker. Then add the chopped onion, garlic, ginger and green chilies. Add tomatoes and white radish. Then add the red chili powder and salt. Add 1.5 cups water and stir. Pressure cook for 5-6 whistles (in a traditional stove top pressure cooker) on high heat until everything is soft and done. If using the Instant Pot (like I did here), cook on high pressure for 5 mins and then let the pressure release naturally. Alternatively, you can also cook everything on a stove top for 20-25 minutes until soft. Open the pressure cooker/instant pot and then use an immersion blender to puree the saag. If you don't have an immersion blender, wait for it cool down a bit and then puree using your regular blender. Blend to a coarse paste. You may blend it to super fine texture using a high speed blender. I prefer it little coarse. Transfer saag to another pot on stove top over medium-low heat. Add 2 tablespoons of maize flour to the saag and mix, this helps in thickening the saag. Set heat to low and let the saag simmer for 20 to 25 minutes on low heat. It will thicken as it simmers. For the final tadka, heat a small pan on medium heat. Once the pan is hot add ghee to it and then add hing and chopped garlic cloves. Saute for few seconds and then add the chopped onion and dried red chilies. Cook until the onions and garlic turn light golden brown. Add the coriander powder and garam masala and mix. Transfer the tadka/tempering to the saag and mix. 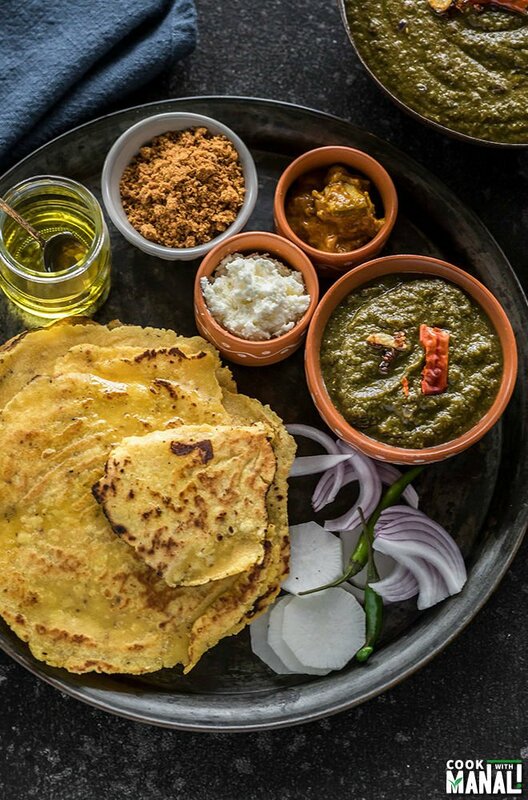 Serve sarson ka saag with makki roti, sliced onion, jaggery and white butter! Make it Vegan: use oil in place of ghee. Make it gluten-free: make sure the hing (asafetida) that you use is gluten-free. Rest of the recipe is gluten-free as it is. Use a ratio of 2:1 for mustard greens to other greens.